5 April 2019 – Documenting differential pairs without underlying ground planes for Gigabit Ethernet routing in Speedstack. 4 April 2019 – CGen V19_03 adds utility for changing multiple structure descriptions when exporting CITS test files. Until now changing structure descriptions when automatically generating CITS impedance test files from CGen was a tedious line by line process. CGen 19_03 resolves this with a simple to use utility. Please contact Polarcare for upgrade information. Addresses a bug from 19_02 where failed boards may not appear in the results please contact Polarcare for upgrade information. With many Polar customers building high volumes of product the new Monte Carlo impedance analysis in Si8000m and Si9000e 2019 makes light work of simulating impedance variation in production. Here is an example screen with all input parameters of a microstrip being randomised over 10000 iterations and here is another example where prepreg press thickness is varied on a stripline (exaggerated for clarity.) Monte Carlo analysis is included in your Polarcare update for 2019. YouTube video (alternate non YouTube video). 11 March 2019 – Stackup templates for Speedstack including HDI and Flex. Sample stackups rigid / flex and HDI to give you a flying start when designing and documenting stackups in Speedstack - view templates here. 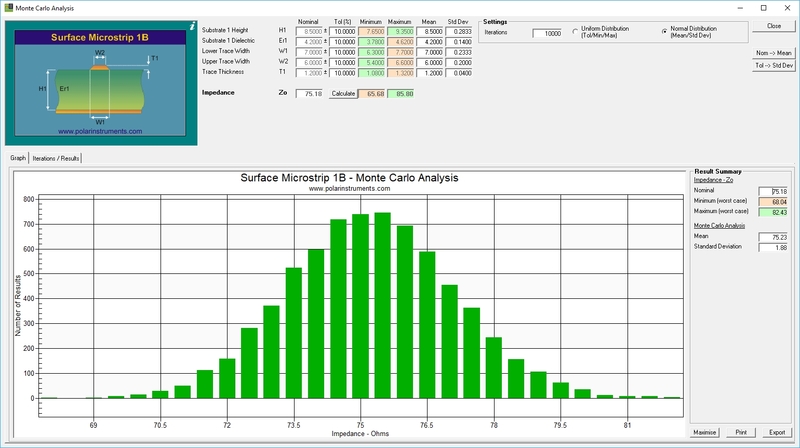 27 February 2019 – Monte Carlo impedance analysis – coming soon for Si8000m and Si9000e. With many Polar customers building high volumes of product the upcoming Monte Carlo impedance analysis in Si8000m and Si9000e 2019 will make light work of simulating impedance variation in production. Here is an example screen with all input parameters of a microstrip being randomised over 10000 iterations and here is another example where prepreg press thickness is varied on a stripline (exaggerated for clarity.) Monte Carlo analysis is included in your Polarcare update – so please check back here for the release date in the coming weeks. 06 February 2019 – Speedstack 2019 release - now shipping. New features for Speedstack 2019 include enhanced handling of loss tangent in Speedstack Si and more drill / via fill capabilities and further enhanced modeling of the effects of copper roughness. YouTube video (alternate non YouTube video) Or in a PDF if you prefer. If you use Speedstack extensively and link into other systems - please do speak with your local office before you upgrade. 21 January 2019 – Atlas PCB Insertion loss test system V19.01 supports Delta-L 3 line Delta-L with uncertainty factor. Atlas 2019 released with stability enhancements for Delta-L. The 2019 edition includes a number of other customer requested usability enhancements. Please contact Polarcare for upgrade information. Atlas 2019 is shipping now and supports SET2DIL / SPP / Delta-L and Delta-L 3L methods. 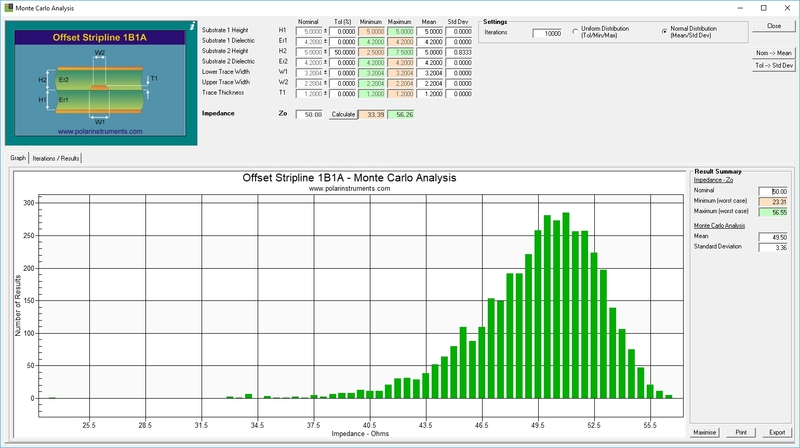 New features for Speedstack 2019 include enhanced handling of loss tangent and more drill / via fill capabilities and further enhanced modeling of the effects of copper rougness. YouTube video (alternate non YouTube video) Or in a PDF if you prefer. EMC materials further updated in Speedstack on line libraries. This application note describes dielectric constant and loss tangent and their relationship in easy to understand terms. Speedstack libraries are updated with a number of revised and new material families from EMC, Taconic and Ventec. If you are using Speedstack 18:05 or above these will automatically appear in your on line library. YouTube video (alternate non YouTube video). Speedstack libraries are updated with a number of revised and new material families from EMC, Taconic and Ventec. If you are using Speedstack 18:05 or above these will automatically appear in your on line library. 14 June 2018 – CITS880s 2018 enhanced test regions and simplified saving of full results "Snapshot"
CITS880s 2018 contains several customer requested enhancements, including adjustment of test limits without the need to re acquire test data, autosaving of all test and result waveform data when logging results along with other usability enhancements. Contact Polarcare for upgrade information. Learn more from this YouTube video (alternate non YouTube video). An easy to use enhancement which enables simple data entry based on Rz to estimate Huray Parameters for surface roughness modeling with Speedstack Si & Si9000e. Contact Polarcare for upgrade information. Learn more about Speedstack Si 2018. How closely should modeled impedance match your measurements? Watch this new 6 minute guide. Speedstack Si has undergone a transformation for 2018, the same familiar easy to use interface, with a host of new insertion loss capability, including comprehensive reporting for material losses and support for roughness modeling. Watch this introduction on the Polar YouTube Channel. Dorine joins Polar with a career that spans Mentor Graphics, Lattice Semiconductor and Tektronix. Dorine steps into Ken Taylor's shoes; Ken is retiring and Polar is pleased that he remains as a Non Executive Director of Polar Instruments Ltd. It is 21 years since the Polar Instruments website went live. Back then the DVD was just being released in Japan and it was two years "BG" "Before Google". The Polar website keeps its useful content but has a fresh new look and simplfied navigation. I-Connect 007's Andy Shaughnessy and Pete Starkey interview Martyn Gaudion at Productronica 2017 discussing Polar's Secrets of High Speed PCBs book and new capabilities for Speedstack Si in 2018 more. Speedstack Si has undergone a transformation for 2018, the same familiar easy to use interface, but a host of new insertion loss capability, including comprehensive reporting for material losses and support for a variety of roughness modeling methods. The Si9000e Speedstack link now contains a rich palette of insertion loss data – see more. Andy Shaughnessy interviews Polar's Martyn Gaudion on the subject of latest enhancements in Polar tools for 2018 including the radical enhancements for Speedstack Si – read the interview here. This article penned by Bert Simonovich in the October PCB design magazine shows you how to model high speed transmission line characteristics with data sheet values using both Keysight ADS(TM) and Polar Si9000e – more. Tangential thoughts is Martyn Gaudion's take on being careful when using loss tangent values. Just because there are a couple of leading zeros – it doesn't reduce the significance of the number; see "The PCB design magazine" more. If you are a Speedstack Si customer it is recommended that you upgrade to version 17:08. v17.08 will install some enabling elements of Speedstack 2018 and will make the upgrade to Speedstack Si 2018 a smoother process. Read more. This application note by Bert Simonovich focuses on applying the Cannonball model to determine the input parameters needed for Huray roughness model in Si9000e using data provided solely by manufactures’ data sheets. Read more. Si8000m and Si9000e V17:07 support bulk importing impedance test results. This powerful new capability (which is now released) lets you graph measured production variation vs predicted modeled impedance. See for youself in this pdf presentation or watch the preview on the Polar YouTube channel. Version 17:06 of the Si8000m Interface Module is released and tested in conjunction with Frontline PCB InPlan(TM) V5.0. Circuit Foil materials are uploaded and available for all users with access to the Speedstack online library. See for youself how easily you can fine tune Stackups by using the optional "Projects" feature in Speedstack and Si8000m or Si9000e on the Polar YouTube channel. Updated Iteq material libraries are uploaded and available for all users with access to the Speedstack online library. 13 July 2017 – How to document sequential lamination plan. See for youself how easily you document sequentially laminated stackups on the Polar YouTube channel. Mitsui foils are uploaded and available for all users with access to the Speedstack online library. The upcoming releases of Si8000m and Si9000e for Q3 of 2017 will support importing CITS log files from newer CITS. This powerful new capability lets you graph measured production variation vs predicted modeled impedance. See for youself in this pdf presentation or watch the preview on the Polar YouTube channel. Loss tangent is a tiny ratio – but with a directly proportional effect on insertion loss; this new application note helps you ensure accurate modeling. 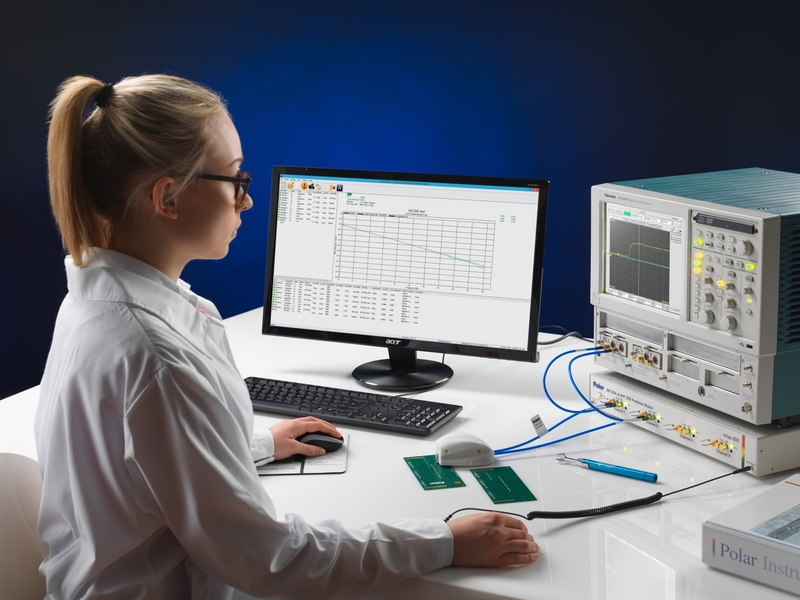 The/ June release of CITS880s enhances testing fine line impedance controlled traces with series resistance by adding normalisation in addition to LPE methods. CITS880s 17:06 also includes "intermediate" test settings to flag marginal results. Ask Polarcare about updating. The May / June release of Speedstack brings you online connection to over 16 popular updated material supplier libraries – find our more on the Polar YouTube channel or in this pdf. Update Speedstack by asking Polarcare. Part 2 of Martyn Gaudion's new eBook "Secrets of High-Speed PCBs" is released in conjunction with I-Connect007. Register and download your copy of part 2 here. The May / June release of Speedstack slated for later this month brings you online connection to over 16 popular updated material supplier libraries – find our more on the Polar YouTube channel. See whats new in Speedstack 2017 Q2 update on the Polar YouTube channel. Martyn Gaudion's new eBook "Secrets of High-Speed PCBs (Part 1)" is released in conjunction with I-Connect007. Register and download your copy here. A brief introduction is also on the Polar YouTube channel. Huray and Groisse rougnhess models now available in release 17:03 edition of Si9000e 2017. More information will be released when shipping dates are confirmed. These two methods will ship in addition to the existing Hammerstad roughness Please contact Polarcare or your local Polar office for more information. Atlas 17_03 is released with enhanced compatibility for Tektronix DSA8300 sampling units when used in SPP insetion loss testing applications. Huray and Groisse rougnhess models are slated for release in the Q2 edition of Si9000e 2017. More information will be released when shipping dates are confirmed. These two methods will ship in addition to the existing Hammerstad roughness model. 12 December 2016 – IConnect007 interview – more designer control. Pete Starkey interviews Martyn Gaudion at Electronica "New tools mean more designer control" – read the interview here. 12 December 2016 – IConnect007 interview - more designer control. Read Martyn Gaudion's column on PCB007 – "The Pulse" – this month covering vias modeling and signal integrity. Enhanced support for Flexrigid PCB stackups with bikini builds, plus support for idendifying impedance structures with Net Class information, along with a host of of other enhancements including a beta proportional stack view mode. Speedstack 2017 is available now for customers with active 2017 Polarcare. Please contact Polarcare for upgrade information or explore the changes in this presentation. PCB supply chain managers and procurement engineers sometimes wonder why, even with a fully specified PCB, they receive different builds from different suppliers and even sometimes multiple different builds from the same fabricator. Application Note AP517 describes how Speedstack technical reports deliver flexible and high quality communication for PCB fabricators and brokers, reducing the chances of miscommunication and providing professional stackup documentation from end to end of global and internal supply chains. Speedstack 2017 is about to go into beta testing, featuring enhanced support for bikini builds, support for structure net classes and better support for new and legacy xml export. We are also testing an experimental proportional stack view. This new application note shows you how to calculate impedances when structures reference non adjacent planes. Si9000e and Atlas 16_07 allow direct importation of measurement data from Atlas SPP, Preview the capability here. Si9000e and Atlas 16_07 allow direct importation of measurement data from Atlas SPP, SET2DIL or Delta-L into Si9000e. Once imported the data is parsed and modelling data displayed on the same graph – a single click then allows you to goal seek Loss tangent allowing you to explore the relationship between predicted and measured attenuation. Many CITS880s customers asked for a “save all results and waveforms” facility as in the Atlas environment. CITS880s v16_07 adds this new capability. Delta-L+ insertion loss testing with enhancements for HVM test is slated for a future release of Atlas. In addition the ability to import loss test data into Si9000e is being enhanced with a direct link in the next release of Si9000e and Atlas significantly simplifying the process of estimating loss tangent. Please contact Polarcare for more information. The Atlas web page can be found here. To view a short introduction clip, watch here or download from this video. Loss tangent goal seeking is set for imminent release on the Si9000e insertion loss field solver. By entering your insertion loss measurement from Atlas or other insertion loss test system, in conjunction with trace cross section data – the Si9000e will model the copper loss and estimate the dielectric loss of the substrate. More to follow in an upcoming Polar news emailing. Subscribe to the Polar email newsletter here. Delta-L insertion loss testing is now supported in Atlas 2016. Please contact Polarcare for more information. The Atlas web page can be found here. To view a short introduction clip, watch here or download from video. Polar email archive lets you search through Polar email news history – view Polar emailing archives here. Flexera has alerted us to a security vulnerability in their license server components shipped with Polar signal integrity tools. 2016 releases of Polar software (Speedstack / Si8000m / Si9000e CGen) address this vulnerability. Flexera recommend updating in order to address this situation. Please contact your local Polar office for information. Si8000m and Si9000e 2016 versions now support 8 additional structuresincluding a range of groundless differential structures and a much requested pair of “broadside over pre-preg” structures. In addition Si9000e simplifies the deployment of causal modelling of s-parameters. Bill of materials output is now included in an interim release of Speedstack 2016 this module when enabled provides printout of stack bill of materials and supports multiple barcode formats. 02 March 2016 – Impedance variation with frequency can be counter intuitive. 26 November 2015 – Speedstack 2016 retains structures when editing layer types. 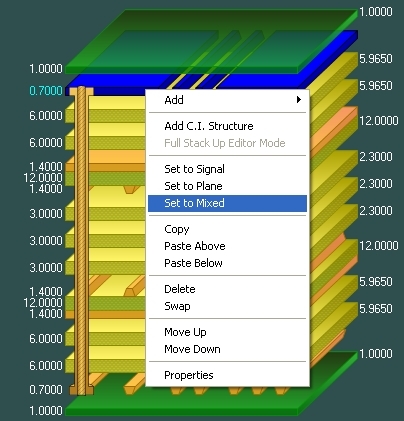 Scheduled for January 2016 release Speedstack 2016 retains and re-allocates structures when changes are made to the electrical layers of the stack up. Structure Layer Properties and Structure Validation toolbar lets you re-allocate structures after stack up changes: Add foil / core – increase layer count, Delete foil / core – reduce layer count. For more information please contact Polarcare. 17 November 2015 – How to use powerful new projects capability for Si8000m & Speedstack. This new application note shows you how to use the new projects capability in Si8000m Si9000e and Speedstack. 15 November 2015 – Delta L insertion loss method slated to release in Atlas Q1 2016. In line with our aim to offer a complete solution of both impedance and insertion loss products, Polar Atlas insertion loss test system will add Delta-L insertion loss capability during Q1 2016, this in addition to SET2DIL, SET2SEIL and SPP capabilities (read more). 12 November 2015 – PCB007's Pete Starkey interviews Martyn Gaudion at Productronica 2015. PCB007's Pete Starkey and Martyn Gaudion discuss Polar's efforts to simplify specification issues relating to layer stackup in the PCB supply chain. 30 October 2015 – Counterfeit Polar probes may void CITS warranty. Counterfeit probes bearing a copied Polar logo and part number have been identified in circulation. These probes appear as very good copies of legacy Polar IP probes. These probes are not made from ESD safe materials and their use will void your CITS warranty. If you suspect you have been supplied counterfeit probes through unofficial channels please alert Polarcare. CITS880s Version 15:10 will shortly be shipping – Version 15:10 supports enhanced calibration for groundless on board differential testing. Please contact Polarcare with your Polarcare contract number for update information. New and updated material libraries for Ventec materials are now available. Please contact Polarcare with your Polarcare contract number for update information. 30 September 2015 – GRS500 repair test system & CADView 2016 now shipping. GRS500 flying probe repair test system and CADView software version 2016 is now shipping. This enables GRS customers to upgrade to a Windows 7 or Windows 10 (Polar supplied) controller PC, and also brings compatibility for Adobe Acrobat readed XI (V11.0.12). Contact Polarcare for price and update information. Save time navigating the Polar site by checking out the 10 most popular pages for the present month. 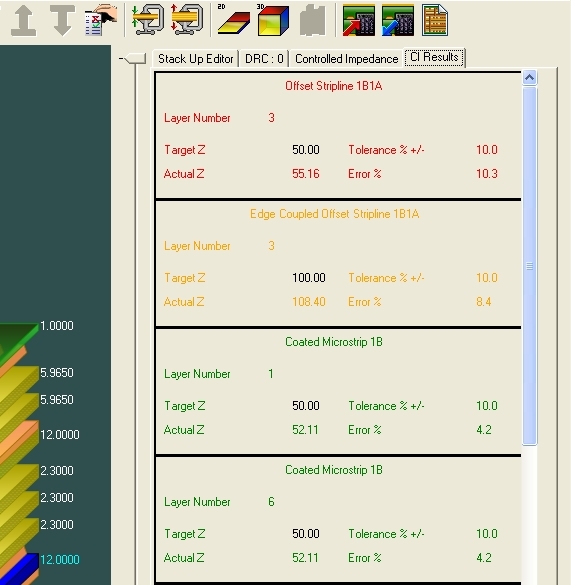 02 September 2015 – Documenting and calculating stackups with coated and uncoated structures. Revised and updated AP524 documents how to calculate and document stackups containing both coated and uncoated surface impedance structures. 26 May 2015 – Polar joins Mentor Graphics OpenDoor program. Future releases of Speedstack will interface with Mentor Xpedition®, and Mentor Constraint Manager. Polar recently joined the Mentor OpenDoor program to facilitate this link. 14 May 2015 – Latest ISOLA libraries now shipping with Speedstack. Isola have updated the Speedstack libraries with the latest base material information. For an evaluation of Speedstack or updated libraries if you have an active Polarcare contract please contact Polarcare for information. 17 February 2015 – CITS880s 2015 now shipping with groundless differential on board testing. Groundless differential testing is available now on the 2015 edition of CITS880s. Unique is the ability for CITS to measure groundless differential structures with an innovative probe design utilising a single cable connection to the instrument - both easing the operator workload and lowering the cost of ownership. To implement groundless differential test you will require the latest CITS880s software and new GDPS series impedance probes. Contact Polarcare for information. 23 January 2015 – Launch Point Extrapolation better represents instantaneous impedance. A new application note explains how the adoption of Launch Point Extrapolation (LPE) allows better correlation between measured and modeled impedance on fine line PCBs. 04 December 2014 – CITS880s to support groundless differential on board testing in 2015. Advance information: In response to customer demand the CITS880s will offer support for groundless differential testing during Q1 2015. The CITS880s builds on the proven CITS880 platform which has revitalised CITS performance for a new generation of impedance controlled PCBs. For more information please contact Polarcare. See also CITS880s. 16 November 2014 – Atlas PCB version 14_11 now shipping. Launch Point Extrapolation (LPE), now added to Atlas meaning LPE is now available on both CITS PCB impedance test, and Atlas insertion loss & impedance test platforms. 11 November 2014 – CITS880s version 14_11 now shipping. CITS880s Launch Point Extrapolation (LPE), further enhanced following feedback from launch customers. PCB fabricators to improve impedance control for the latest high-speed PCBs which use finer trace widths and thinner copper when compared with conventional boards. CITS880s also includes new ESD dissipative IPS probes and is capable of measuring traces 2 to 3 inches shorter than previous generation CITS. For more information please contact Polarcare. See also CITS880s. 16 October 2014 – Royal Circuits / Polar Instruments webinar. "All about stackups"
Another chance to see the Royal Circuit Solutions / Polar Instruments - "All about stackups" webinar featuring Tim Madden -Senior CAM engineer at Royal Circuits and Michael Bode - Product specialist at Polar Instruments Inc. Watch the webinar here. 10 October 2014 – New CITS880s now shipping. CITS880s introduces Launch Point Extrapolation (LPE), enabling PCB fabricators to improve impedance control for the latest high-speed PCBs which use finer trace widths and thinner copper when compared with conventional boards. CITS880s also includes new ESD dissipative IPS probes and is capable of measuring traces 2 to 3 inches shorter than previous generation CITS. For more information please contact Polarcare. See also CITS880s. Atlas 2014 V14:07 as announced on 25 June is now shipping. Here is some more detailed information. Please contact Polarcare if you would like to upgrade or evaluate. Option software emulated Impulse Forming Networks unique to Polar Atlas enable test of longer traces and improve the ergonomics of the system whilst keeping the entry price for SPP testing at very economic levels. 2014 releases of Si8000m and Si9000e V14:07 are shipping now, here is a preview. Please contact Polarcare for further information. Atlas 2014 will ship from July - Featuring new "Soft IFNs" enabling a second generation of SPP test with improved signal / noise ratio and less user intervention. Customers will also enjoy improved pricing when compared with first generation SPP systems. Contact Polarcare for information as it becomes available. 2014 releases of Si8000m and Si9000e are in final test, new features focus on even better interaction between modeling and both CITS impedance and Atlas insertion loss measurement systems - for example to accompany the introduction of SPP test in Atlas the Si9000e now features plots of Alpha and Beta. Here is a full PowerPoint preview. In 99% of applications Polar recommends users use material dimensions and properties from the Speedstack library - however in some limited circumstances it can be necessary and advantageous to override the library derived data for height, dielectric constant (Er), trace thickness, coating or coating Er. Using Er as an example - application note AP535 shows you how. Speedstack 2014 v14.05 includes, as purchasable options, data exchange using IPC-2581 Rev B and file import in Ucamco .job file format. IPC-2581 Rev B, an efficient single file industry-standard XML data exchange format for use between designers and manufacturers of printed circuit boards, now includes PCB stackup data. The .Job file format can contain a varying amount of stack up information, including user-definable material / drill class definitions. Speedstack 14.05 will import .Job files from Ucam and Integr8or. Atlas 2014 with enhanced support for SET2DIL and SPP will ship April 13th, Polar now provides complete measuring modeling, stackup and coupon generation for SPP & SET2DIL methods of insertion loss test. Email: Polarcare for information . See the 14:04 enhancements here. Sample insertion loss coupons for first time SET2DIL training and ongoing deskew setup, plus sample SPP coupon for SPP training and setup applications. Packaged in a professionally crafted ESD safe enclosure. The popular EPD100 Transmission line equipotential viewer is renewed for 2014 with a no charge license grant for all users. The EPD100 is ideal for technicians and engineers new to transmission line theory and shows how the equipotential lines are distributed on single and differential lines (driven by odd and even signals.). Engineers often want to know how much process window is available for a given impedance tolerance &ndash; recent editions of Si8000m and Si9000e support an easy to use process window facility. This application note shows you the secrets. CGen PCB and CGen Si 2014 are both shipping now. This Powerpoint explains the new features in both Speedstack and CGen for 2014 &ndash; CGen information is from Slide 20 onwards. CGen Si now includes support for SPP, plus SET2DIL and SET2SEIL version 3 coupons &ndash; both with and without fiber weave mitigation. Many standard coupon styles are enhanced to support high structure count coupons. See the 2014 enhancements here. Speedstack 2014 is now shipping with a host of customer requested enhancements especially focussed on making Speedstack easier to learn and easier to use in a high layer count environment. First time users to will find a shorter learning curve with more logical messages and logical menu structures. See the 2014 enhancements here. Atlas 2014 with support for SET2DIL and SPP is now shipping, Polar now provides complete measuring modeling, stackup and coupon generation for SPP & SET2DIL methods of insertion loss test. Email: Polarcare . See the 14:00 enhancements here. Release candidate evaluation editions of Speedstack 2014 are now available in advance of the Feb 1st 2014 ship date. Ask Claire for your evaluation license simply email: Polarcare . See the 14:02 enhancements here. 19 November 2013 – Speedstack 2014 – what's new? Preview the 2014 release enhancements about to appear in the 2014 release candidate 14:02 for Speedstack, which includes a new material library wizard – a powerful copy and multi paste material properties facility and a variety of changes designed to make the interface more approachable including enhanced support for editing stacked vias. See the 14:02 enhancements here. Pete Starkey interviews Martyn Gaudion for Realtime with PCB007 at Productronica 2013 Watch the interview. Munich November 12-15 Polar announces preview of Speedstack 2014 with enhanced editing capability, new stackup wizard, improved support for stacked vias and many more customer requested user enhancements . Stand A1.545 & B1.519 for more information contact Neil Chamberlain – Signal integrity product manager. Munich November 12-15 Polar announces preview of Atlas 2014 with support for SPP test methods in addition to SET2SEIL and Bidirectional SET2DIL and support for 30GHz and 50GHz sampling heads. Stand B1.519 for more information contact Neil Chamberlain – Signal integrity product manager. Read Martyn Gaudion's column on PCB007 – "The Pulse". Rooting out the root cause (of impedance measured and modeled correlation) – read it here. Following the introduction of SET2SEIL S21 test capability – Polar is pleased to offer a SET2SEIL test service in addition to the existing SET2DIL test service. Please contact Polarcare for more information. Test services are ideal for PCB fabricators and OEMs who have not yet reached a level of testing to justify investment in an Atlas test system. Announcing Atlas insertion loss test system support for SET2SEIL, using enhanced bidirectional methodology for increased test repeatability. Please contact Polarcare for more information or to add this capability into your existing Atlas installation. Please contact your local office for pricing information- Atlas SET2SEIL licenses are shipping now ask for version 13:08 with SET2SEIL license. Offering improved compatibility with earlier CITS CITS880, version 13:07 automatically implements balanced testing for differential lines, along with a number of fixes for autoscale and enhanced ability to load and save color schemes. CITS880 version13:07 is available for all customers with active CITS Polarcare. Contact Polarcare for more technical or commercial information. Improved alignment, Acrobat XI support, step & repeat, enhanced reports and enhanced support for Cadstar / Visula and external instrument control in the latest GRS500 release. Contact Polarcare for more technical or commercial information. GRS500 is designed for low volume manufacture and service applications. Atlas Si™ SET2DIL insertion loss test system is now shipping with Bidirectional SET2DIL. Initial engineering and customer feedback indicates a step function improvement in measurement repeatability and simpler more tolerant initial setup. Learn more about Atlas. Contact Polarcare for more technical or commercial information. Speedstack 13:06 offers power users the ability to generate impedance structures directly from material library data, or alternately to override with structure information manually when there is a requirement for more detailed input than available from the library. This is in addition to many customer requested fixes and print enhancements. Interested? Atlas Si™ SET2DIL insertion loss test system will be upgraded to support Bidirectional SET2DIL from June 2013. This upgrade follows the recent IPC® proposal for SET2DIL insertion loss testing to be enhanced with Bidirectional SET2DIL. Polar customers using previous versions of the Atlas Si™ test system will be offered an upgrade, at no cost, to support Bidirectional SET2DIL testing. Contact Polarcare for more information. The EPD100 offers engineers and technicians new to signal integrity a graphical view of the 2D equipotentials around single ended and differential transmission lines (in odd and even mode), look closely and you can even see the refraction of the line as the equipotential crosses out of the substrate. Contact Polarcare for a no charge download of the 2013 edition . Atlas 13:04 is now shipping and contains a host of usability enhancements along with a new intelligent ESD protection module, snapshot mode for archiving test data and waveforms, plus coming soon a new ergonomic probe housing. SPP capability slated for H2 2013 release. Pictured and web page. Improved processed thickness capability, DRC enhancements, stackup thickness enhancements, printing enhancements, enhanced linking with other systems, run and view multiple instances of Speedstack – see for yourself now. This new Designcon paper looks in detail at correlation of measured and modeled insertion loss and includes consideration for a range of laminates and copper foil profiles. The paper indicates the level of correlation that may be expected between modeling tools and measurement systems in a production environment. Atlas 12:08 is now shipping and contains a host of usability enhancements that smooth the path for new users and save time whilst adding measurement certainty for existing users. Contact polarcare@polarinstruments.com remember to quote your Polarcare contract no. Polarcare customers are entitled to update to version 12:08 of CITS880. This extends support in Traditional and Simplified Chinese, along with a German language pack. 12:08 has other fixes and also adds the capability for raw TDR file export. Contact polarcare@polarinstruments.com remember to quote your Polarcare contract no. Speedstack Version 12:05 brings a raft of usability enhancements along with a more simplfied product naming convention. For rigid PCB fabricators and specifiers – Speedstack is the product of choice, HDI fabricators and designers are catered for by Speedstack HDI, and Flexrigid applications by Speedstack Flex. Finally if you make or design all three types then Speedstack Flex ticks all the boxes. Here is a Powerpoint preview. Professional impedance test reporting, with the printout "look and feel" so liked by Speedstack customers. CITS DRG Pro is designed for the CITS880, but is also compatible with legacy CITS file formats. The CITS880 brings the 8th generation of CITS to the market – with the emphasis on ease of migration from legacy units, and renewed emphasis on accuracy, repeatability and test throughput. Polar Instruments Ltd is offering up to 10 free licenses for Atlas Si (TM) - PCB insertion loss test software during 2012. This is a move to ease the decision to adopt insertion loss testing in the fabrication industry. Atlas is used in combination with 35ps TDR equipment to measure insertion loss with the IPC TM 650 SET2DIL test methodology. Interested? Please contact Neil Chamberlain – Signal Integrity Product Manager. The 2012 edition of CGen impedance coupon generator is now shipping, Version 12.01 features improved more helpful user feedback messages, along with enhanced CITS test program generation and support for an optional additional coupon style – please note that we can also quote for adding your house style of coupon, read about CGen here. The 2012 edition of Atlas is now shipping featuring increased testing speed for both insertion loss testing and impedance tests. Fabricators now also have the ability to set the sample size and averaging for insertion loss tests as specified by their customers. Read about Atlas and SET2DIL insertion loss testing here. Martyn Gaudion, CEO of Polar Instruments and a PCBDesign007 columnist, tells Pete Starkey about the latest developments in design and documentation tools for flex-rigid stack-up. Watch the interview here. Read Martyn Gaudion's column on PCB007 – "The Pulse". Second of a two part article exploring transmission lines from DC to multi GHz?– read it here. The 2012 versions of Polar software are now available on general release. New for 2012, Speedflex HDI supports crosshatch/mesh. Polarinstruments.com now uses Google custom search for a significantly enhanced search capability on the Polar website. See for yourself: Search. Atlas insertion loss test software v11.10 Polarcare release is now shipping – featuring linked impedance and insertion loss tests, along with many enhancements to increase usability. Please contact your local Polar office for more information. Polar is delighted to announce the following major enhancement on CITS900s warranty: 1. 12 month warranty on new CITS900s purchases. (includes front end boards)* 2. 12 month warranty on CITS900s front end repairs. * (* Excludes consumables / replacement of components under warranty does not extend the warranty beyond 12 months) Please contact your local Polar office for more information. SANTA CLARA, CA – PCD&F today announced Speedflex HDI winners of the fall 2011 New Product Introduction Award for PCB documentation tools. Read Martyn Gaudion's column on PCB007 – "The Pulse". First of a two part article exploring transmission lines from DC to multi GHz? – read it here. Speedflex HDI extends Speedstack's proven stackup design and documentation cabability with professional documentation for both Flex-rigid and HDI stackups. Read Martyn Gaudion's column on PCB007 – "The Pulse". It is interesting to stand back every now and then and look at an engineering task from a greater distance?– read it here. CGen V11.04 answers customer requests for a smaller and more panel size friendly insertion loss coupon. Here are screenshots before and after optimization. Please contact Polarcare for update information. Many Si9000e customers have requested drum and treated side copper roughness modeling in the Si9000e. An updated release of Si9000e – 2011 V11.04 now supports this. Please contact Polarcare for update information. Read Martyn Gaudion's column on PCB007 – "The Pulse". When is a 10GHz transmission line not a 10GHz transmission line?– read it here. Polar Atlas Si enables PCB fabricators to test PCB transmission line insertion loss in a tightly controlled production environment. Atlas employs mathematical processing techniques to extract frequency dependent loss characteristics when used in conjunction with suitably designed test coupons and Atlas precision GHz probe assemblies. Contact Neil Chamberlain – Signal Integrity Product Manager. Read Martyn Gaudion's column on PCB007 – "The Pulse". A Voyage of glass reinforcement – read it here. Atlas Si is Polar's new test system designed for accurate and repeatable measurement of insertion loss in a PCB fabrication environment. Following extensive successful beta trials with a number of selected PCB fabricators. Atlas will move from beta to release version during Q1 2011. For more information on Atlas please see this page or contact Neil Chamberlain – Signal Integrity Product Manager. 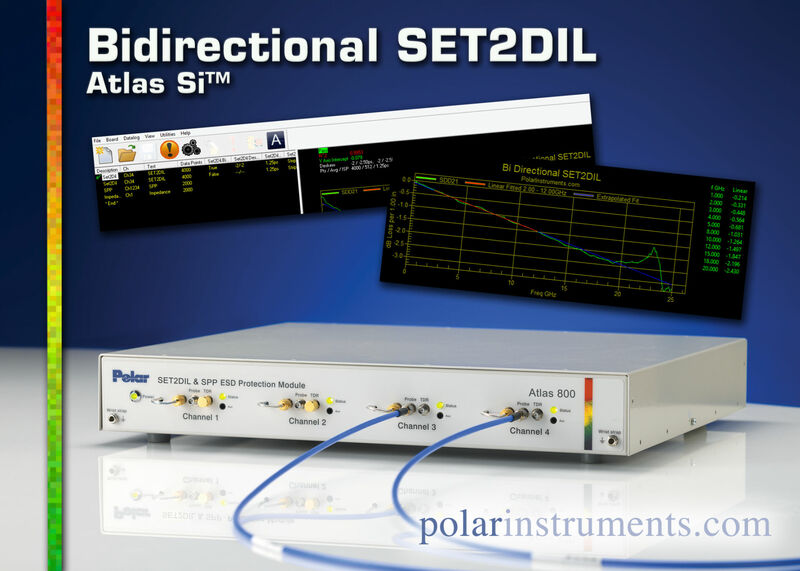 Atlas supports impedance, S21 and SDD21, SDD21 uses the SET2DIL method. Read Martyn Gaudion's column on PCB007 – "The Pulse". Laminates losses and line length Part 2 – read it here. 08 December 2010 – What's new in Si8000 / Si9000 / Speedstack for 2011? Polar's engineering team members are releasing some details on new features requested by Polarcare customers which will shortly be included in the 2011 releases of Si8000m / Si9000e and Speedstack. Here is a Powerpoint preview of 2011 features and options, and click here to see the new enhanced technical report printout in Speedstack 2011. Read Martyn Gaudion's column on PCB007 – "The Pulse". Laminates losses and line length Part 1 – read it here. To make product selection more logical, Polar Signal integrity products will move to a more consistent naming convention over the course of 2011. For lossless lines Speedstack PCB will be joined by CGen PCB and Atlas PCB and for lossy lines Speedstack Si will be joined by CGen Si and Atlas Si. However the industry standard lossy and lossless line solvers Si9000e and Si8000m will retain their existing names. Atlas Si is Polar's new test system designed for accurate and repeatable measurement of insertion loss in a PCB fabrication environment. Atlas is presently in beta trials with a limited number of selected PCB fabricators. Atlas beta 3 is now shipping. For advance information on Atlas please see this page and for information on joining the beta program please contact Neil Chamberlain – Signal Integrity Product Manager: neil@polarinstruments.com. Atlas supports impedance S21 and SDD21 using the SET2DIL method. Read Martyn Gaudion's column on PCB007 – "The Pulse". The October edition covers signal integrity terminology – read it here. 17 September 2010 – The Pulse "All set to measure differential insertion loss"
Read Martyn Gaudion's column on PCB007 – "The Pulse". The September edition covers the testing PCBs for differential insertion loss: read it here. Updated and refreshed, GRS CADView is a powerful paperless repair software and generic CAD viewer which reads and displays PCB layout data from a wide variety of popular CAD systems. A useful "virtual x-ray" facility helps you trace tracks through inner layers with ease. The 2010 edition of CADView is now shipping. For more information please contact your local Polar office. Early adopters of Polar Atlas GHz lossy line test system who participate in the beta test program are entitled to special launch pricing of Atlas software. Atlas includes SET2DIL capability, and the early adopter promotion runs from now until April 31st 2011 more. Updated and refreshed, GRS CADView is a powerful paperless repair software which reads and displays PCB layout data from a wide variety of popular CAD systems. A useful "virtual x-ray" facility helps you trace tracks through inner layers with ease. The 2010 edition of CADView is scheduled for a mid September release. For more information please contact your local Polar office. Atlas is Polar's new test system designed for accurate and repeatable measurement of insertion loss in a PCB fabrication environment. Atlas is presently in beta trials with a limited number of selected PCB fabricators. Atlas beta 2 is now shipping. For advance information on Atlas please see this page and for information on joining the beta program email: set2dil@polarinstruments.com. Atlas supports impedance S21 and SDD21 using the SET2DIL method. 17 August 2010 – "Zen and the art of accurate impedance measurement"
Read Martyn Gaudion's new column on PCB007 – "The Pulse". The August edition covers the best approach towards accurate and repeatable impedance measurement – read it here. Read Martyn's new column on PCB007 - "The Pulse" Covering a variety of controlled impedance, and lossy line articles on both test, design, interfacing between the worlds of design and fabrication. Here is a link to the first edition. A direct Excel interface into the Polar Si field solver engine is now available for lossless calculations on both the Si8000m and the Si9000e. The Excel interface means you can use all your engineering "what if" thoughts to run mathematical and statistical processing on the output of the industry standard Polar field solver. Following extensive consultation with existing and potential users of Speedstack - who express a desire to use Speedstack in a freehand mode without reference to material libraries, we are adding VMM to Speedstack. This new mode makes experimentation with stacks fast and easy, and requires no library preparation. Once the stack concept is complete, it can be either passed to the fabricator who edits in appropriate material, or for more specialized applications the designer can simply perform material allocation in house. More information soon. CGen 2010 Coupon generator, is an enhanced impedance and lossy line coupon generator. CGen 2010 works equally well as standalone, or in conjunction with Si8000m / Si9000e and Speedstack. CGen 2010 is available now. CGen plus will support lossy line coupons – including SET2DIL. For more product information. SET2DIL is a method for the extraction of Differential insertion loss on PCB traces, with the use of a single ended TDR test. Polar plans to adopt SET2DIL as one of the methods for measurement of insertion loss in our forthcoming Atlas, GHz test system. Atlas is designed for production measurement of PCBs which require control of insertion loss. In addition the soon to be released CGen Plus coupon generator will include beta SET2DIL coupons for insertion loss test (Sdd21). Contact: set2dil@polarinstruments.com for more information. CGen 2010 Coupon generator, is a soon to be released impedance and lossy line coupon generator. CGen 2010 works equally well as standalone, or in conjunction with Si8000m / Si9000e and Speedstack. Enjoy a 6 week release candidate license for CGen 2010 by simply entering your details here. (Fill in your details now, as 6 week licenses are only being released until April 12th 2010). This new application note revisits the technical reasons and the economic price you may pay when selecting to use a faster risetime TDR for impedance testing. Polar Instruments' CEO Martyn Gaudion discusses Polar's plans for 2010 and 2011 in an audio interview with PCB Design 007's Andy Shaughnessy. Polar Instruments (Asia Pacific) Managing Director Amit Bhardwaj paints a picture of future opportunities in China and India in a PCB007 interview with PCB007's Steve Gold. He gives his impression of the China design market and its demands and discusses the India design market, which might have even greater potential than China. This application note demonstrates Speedstack's versatility, using the Speedflex Navigator to document a stackup where the board includes areas that are coated with photoresist and surface traces that remain exposed. 10 February 2010 – What's new in 2010? 2010 sees innovative new features and enhancements in Polar's PCB controlled impedance, PCB stackup and PCB signal integrity product line. Details in this Powerpoint presentation. Customer feedback on the initial release has resulted in major improvements to the Speedstack Coupon Generator user interface. Interface changes mean coupon dimensions now change dynamically, and users can see their adjustments in real time through the use of new "scrubber" controls. Speedstack Coupon generator is also now capable of working with Speedflex. Mostly beneath the surface changes to Speedstack, primarily to support Speedflex optional Flexrigid capability, and also some underlying changes to the file format to support a future planned stackup search facility. Si9000e – 2010 adds the capability to import Touchstone(TM) data so that users can compare measured and modeled S-parameter data. Plus the ability to set the solver into enhanced accuracy mode which is useful where you are working with thin copper layers. Si8000m adds improved graphing capability, plus the ability to track W1/W2 trace width when adjusting trace size. A number of underlying bugfixes are also applied to the BEM solver engine. 2010 editions of Speedstack, Si8000m, Si9000e, Speedstack Coupon generator are now shipping, and available on request to customers with active Polarcare contracts . Polar's longest serving distributor – Daniel Corvaisier of Equitest in France has decided its time to take life easy and retire after over 24 years of representing Polar in France. All the Polar team wish Daniel a long and healthy retirement. Polar Instruments Europe Ltd will provide direct factory sales service and support for our French customers. To simplify website navigation a products page is now available containing a simple list and link to popular Polar product pages more. This new application note explains how to use the Si9000e to select the best price / performance of PCB laminates used in ultra high speed digital applications. 2010 editions of Polar software will be tested for Windows 7 compatibility. Speedflex and Speedstack are slated for January release along with Si8000m and Si9000e, Speedstack Coupon Generator 2010 is set for release during the first half of 2010. An active Polarcare contract entitles customers to a free of charge update on release. Please contact your local Polar sales office for information on other products and Windows 7 compatibility. Polar's longest serving distributor – Daniel Corvaisier of Equitest in France has decided its time to take life easy and retire after over 24 years of representing Polar in France. All the Polar team wish Daniel a long and healthy retirement. From January 2010 Polar Instruments Europe Ltd will provide direct factory sales service and support for our French customers. 22 September 2009 – Coupon generator 50% discount offer. How to avoid 2010 price increases on some IP probes: Jan 1st 2010 sees significant price rises on many Polar IP series probes. However the 6 highest volume selling IP probes will remain at existing prices. To help minimize the effect of this price change there is a 50% discount offer on the Speedstack Coupon generator both annual and full licenses until 31st December 2009 . Missed the live webinar? Now listen to the full version online: Nearly 300 people attended Dr. Eric Bogatin's live Stackup design for differential pairs webinar. Between now and November 15th 2009 you can enjoy the recording – including an interesting Q&A session in full. From Nov 15th on a subscription will be required. Simply register on the www.bethesignal.com site and once you have completed free registration – you can view the webinar from here. Now you can assist other prospective Si8000 / Si9000 and Speedstack users by submitting a brief review of the product. Our web team are happy to receive reviews of what's good, what's not so good and where you find the product useful. Reviews will be uploaded onto the website on a monthly basis. A number of key changes made in CITS900s version 9_03 and above are field proven to increase product reliability – in particular with regard to the occasional loss of electronic serial number. All CITS900s customers regardless of PolarCare cover should update to 9_03 or higher. This is a free of charge update and must be installed to ensure standard warranty cover. 05 August 2009 – Stackup design for differential pairs. Which is better loosely coupled or tightly coupled differential pairs? Will the location of the top and bottom planes in a stack up really affect the differential impedance? How do I achieve a 100 Ohm differential impedance in stripline? What about 85 Ohms? Why do I care? What will affect the losses in the line? How much is too much? If you struggle with any of these questions and want to learn about how the physical design of differential pairs affects the performance of the interconnect this free webinar is for you. The Si9000e calc engine from Version 9_07 onwards now enforces causality in the interpolation of Er and Tan Delta. As a result the Si9000e s-parameter output is now causal. 06 July 2009 – Zuken DFM Center – Speedstack link. Zuken and Polar are delighted to announce the ability to link DFM Center with Speedstack to assist in improved communication of PCB buildup between design and fabrication. Q: Why are the first and last impedance readings on the graph on slide 7 of AP8171 different values?A: The solution is included in a revised version of AP8171 found here: 1st Prize: 3 month Si9000e licence: Ian Kilburn – Dyconex AG Runner up: 1 month Si9000e licence: Radu Alexiu – Conex Electronic Runner up: 1 month Si9000e licence: Alex Novickis – Apcon, Inc.
23 June 2009 – * Win a 3 month Si9000e license! Speedstack 9.04 is now fully released, including new controlled impedance results tab, color coded pass/fail structure navigation and ability to switch layer types without re entering structures. The autostack engine is also enhanced. Upgrades from PolarCare email this link for new inquires. Please note from 08 May 2009 Polar Instruments, Inc. has a new address – telephone numbers unchanged. 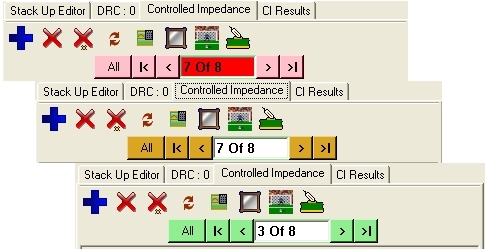 Speedstack 9.04 is days away from release, including new controlled impedance results tab, color coded pass/fail structure navigation and ability to switch layer types without re entering structures. Rick and Ken discuss Si9000 and Speedstack at IPC Expo 2009. "An S-Parameter Calibration Analysis of Polar Instruments Si9000" In the note you will discover Eric's insights on comparing measured and modelled results using a field solver, along with a variety of comparisons of both field solved and measured s-parameter data. All this accompanied by Eric's renowned insights on the interrelationship between measured and modeled results. Free condensed version is available here (you will need to register with bethesignal.com before downloading) it is under the Si Insights Jan 2009 heading: Full version by subscription from www.bethesignal.com or free for PolarCare customers. This application note explains how designers, PCB procurement specialists, PCB field application engineers and front end teams can benefit from clear communication of stackup. This application note explains how to minimise the effect of vias – especially unconnected via stubs through the new Via stub check in the Si9000e. Application note and updated Si9000e version 9.01 now supports modeling of high frequency losses owing to copper roughness. Application note explaining how the stack "remake" capability of Speedstack simplifies the task of material allocation in PCB layer stackups.